Ready to eat products such as cured or smoked meats and prepared foods experience significant damage from light sources. An example of this is revealed in the work of the world-renowned Fraunhofer Institute. "85% of retail displayed luncheon meats had an internal temperature of 10 to 14° C."
They have demonstrated that light causes the photo-oxidation of spices and chemicals in prepared foods. The resulting off flavors and premature discoloration incur significant financial losses in the retail food industry. Increases in surface temperature as little as 2°F (equal to 150 Lux of light) can cause exponential increases in pathogenic microorganisms. 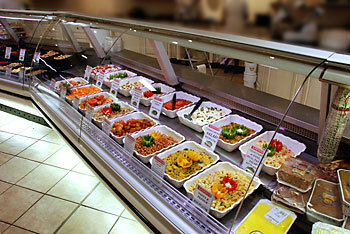 When these facts are considered, Safe Spectrum® is the ideal lighting solution for deli displays. “Q: What causes iridescent colors on meats?" "When light hits a slice of meat, it splits into colors like a rainbow. There are various pigments in meat compounds that can give it an iridescent or greenish cast when exposed to heat and processing. Wrapping the meat in airtight packages and storing it away from light will help prevent this situation." "Q: What causes grayish or green color on cured meats?" Meat Color. Jane Ann Boles and Ronald Pegg. Saskatchewan Food Product Innovation Program: Product Development and Research for Meat Processors. Read Full article here. “Iridescence is a common problem in sliced roast beef and ham products. The dominant color is frequently green and consumers sometimes confuse this with green myoglobin pigments associated with microbial growth." The Influence of Light of Different Wavelengths on Chlorophyll-Containing Foods. M. Thron, K. Eichner, and G. Ziegleder. Lebensmittel-Wissenschaft und Technologie, vol. 34, no. 8 (2001): 542-548. "The oxidative deterioration of lipids, vitamins, proteins, and natural pigments result in off-flavours, loss of flavour and nutrients, and colour fading (Bekbolet, 1990; Thron, 2000)." "Examples of widespread and effective photosensitisers are riboflavin, which is primarily of importance in milk products, and chlorophyll derivatives from components based on vegetable materials (Thron, 2000)." "The quanta absorbed by the absorption maximum of chlorophyll at 650 nm are most effective to photooxidation." "When selecting packaging for chlorophyll-containing foods, the two critical spectral ranges around 400 nm (yellow-green) and 650 nm (blue-green) need special consideration. Foods mainly irradiated by fluorescent light need more protection in the lower wavelength range and foods irradiated by natural daylight in the longer wavelength range."